I once made the mistake of getting friendly with a keen gardener, who emailed me one day to say a large statue of naked ladies was on its way to me. I panicked when I converted its dimensions from millimetres to units I could visualise - what an old engineering pal called "white man's units", in a mocking way that would probably get him into trouble nowadays, though I don't think it should because he wasn't a racist. Just like I am not a sexist. Yet a quoted piece of word-play - "A woman's place is in the stove" - recently got me into hot water. Naively I'd assumed that my feminist convictions - I don't just want equality; I'd like females to run things - would have allowed me to quote something like that and have it recognised as humour and irony. But I guess the problem is that real racists and sexists often play the irony card to get themselves off the hook. So the safe course is never to say the opposite of what you believe because somebody, somewhere will take it at face value and get the hump. So let's back to the naked ladies. Except I do have another problem with irony and in particular postmodernism. My son's girlfriend, a very smart musician and cultural student, was talking about her thesis the other day, and it turns out the French philosophers Deleuze and Guattari feature prominently. When she told me this a rare event occurred - I didn't say the first thing that came into my head. Why? Because I had come across these guys before and believed their thinking to be as woolly as their pullovers. You see in 1996 a physicist called Alan Sokal submitted to an academic journal of postmodern studies an article that was accepted and published despite being gibberish from beginning to end. It was an experiment, Sokal explained, to test the intellectual rigour of postmodernists by seeing if "a pastiche of fawning references, grandiose quotations and outright nonsense", clothed in pseudo-scientific language, would be accepted by them. A few years later, in a book called Intellectual Impostures, Sokal dissected the work of prominent postmodernists, including Deleuze and Guattari, and showed much of it to be as devoid of meaning as his own hoax paper. All of which means I now have to walk a fine line between intellectual rigour and attacking someone's academic interests. It's a balancing act that comes hard to me. 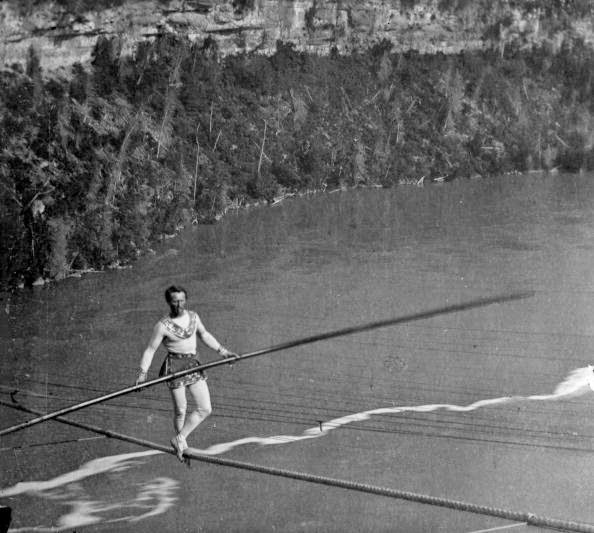 If my brain was Charles Blondin, the high-wire walker, it would long since have plummeted into the icy waters of the Niagara Gorge. Rather than chewing the fat in a rational way I tend to beat people about the head with the bone. I really don't want to do that to my son's girlfriend and my first problem is I'm headed off right now to meet the two of them for lunch. My second problem is I've run out of time and space, without getting to the story of the statues. So here's my suggestion. You wish my brain luck with its lunchtime balancing act. I give you the story of the naked ladies tomorrow.